This is a 12 page 8.5 x 11 inch booklet for use in groups or one-on-one career counseling/coaching. It is designed to let the user proceed at their own pace and discover their own personality spectrum. The clients write in this pamphlet and keep a permanent record of their results through this process. Inside, there is a 21 question assessment where the client discover their personality temperament. This assessment is simple and accurate. After taking the quiz and ranking themselves, the clients turn to their primary personality page and read about themselves. Then they turn to the transferable skills page of their primary personality style and circle their top five skills. A sample of the Doer skills is shown below. 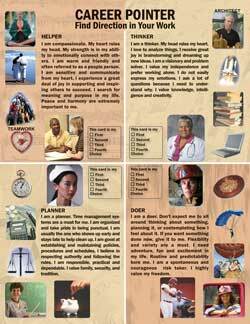 On the same page as the skills are a list of occupations for their primary personality, as shown by the sample below. The last page ties it all together . It is a summary page where the client records all their results and also has a free form area for their notes. Special Purchase for lots of 25 Career Pointers. The final price will be $148.75 for 25 or $5.95 each.